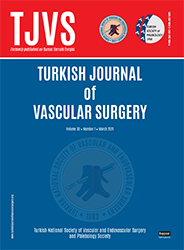 1Dicle Üniversitesi Tıp Fakültesi Göğüs Kalp Damar Cerrahisi Anabilim Dalı, Diyarbakır Aim: Controversy stili exists in the management of carotid arterial injuries. The purpose of this report is to reas­ sess the diagnostic and theraeutic problems encountered in this type of injuries. Methods: The hospital records of 9 patients with carotid arterial injuries treated in our clinic in the last 11 years were retrospectively reviewed. Results: Ali injuries w6:e due to gunshot wounds. Four of the 9 cases were comatose on admission. There were associated venous injuries in 4, ductus thoracicus injury in 1, vertebral artery injury in 1, brachial plexus injury in 2, and arteriovenous injury in 1. We performed end-to end anastomosis in 2, arterioraphy in 2, combined arterial and venous ligation in 1, saphenous vein graft in 1, and synthetic graft replacement in one patient. One patient who was comatose on admission died intraoperatively. üne of the comatose patients wesa decerebrated postoperatively and died at the sixth hour. Another comatose patient died on the third postoperative day. Thus, 3 of 4 comatose pa­ tients died.